Whenever I feel I'm overworked, I simply flash back to my lazy, hazy, utterly brutal clamming days. My body still hurts from those years. I'm serious. It's called "clammer's shoulder" and it never goes away. Tuesday, November 06, 2018: Selfishly, I couldn’t pick a finer day for things to be all fogged up and soakacious. I’m fully entrenched at work until way late, due to the elections. It will keep me editing so late – and de-energize me so thoroughly – I doubt I’ll even stop by the Ship Bottom bayside fishing dock to do some idle jigging in the dark. I don’t speak much of my pier-top angling sessions since, well, there’s not much to speak of -- short of shorts and more shorts. Of course, a better bass from that dock would be enterable in the Classic. Not that I’d go that route. I still abide by the oceanfront mentality contained within the earliest derbies, i.e. only ocean-facing hookups count. That said, I’ll promptly enter a keeper fish should I take one from the back cut at Holgate, which had long been just barely off-limits. Here’s a pic of the boundary sign being put up on Holgate. My biggest bass over the past decade have come from the back cut. All plugged. One was pushing 20 pounds. I nabbed that bigger bass from the west point, adjacent to the back cut, which gets very roughed up during outgoing tide. It hit so near the dry sand it all but beached itself. I intentionally let it get its bearings, so it could swim out and put up a fight. I then felt bad because, once landed, I realized it had inhaled my plug. I surgically freed the lure by pulling it through the gill plate. Bloodied, it still swam off like a champion since I didn’t sever any of its gill arches. I perfected that intricate through-the-gill removal of a “swallowed” hook after a lifetime of pickerel fishing, a fish that routinely gets gut hooked. The ocean remains prohibitively sloppy; pushing five-foot waves and loads of lateral current. You can’t tell me this hasn’t become a mighty junked out fishing fall, wind-, wave- and weather-wise. And when we do get a laydown of conditions, the fish will have no part of it. Of course, I see great bassing things on the immediate horizon. I say that as if playing a slot machine, knowing I just have to hit it big any second now. As recently noted, my weekly column addresses the hideous surfcasting times which have befallen LBI. It needs to be written about – and might even spur a protest bite by the bass. It hits the streets/cloud tomorrow. I'm not into politics at all but does anyone know if Putin is ahead? After yesterday's intro into shoreline wind energy via turbines, I need to offer this from the Sierra Club. Again, I'm taking this in with a grain of saltwater but options to fossil fuels must be explored. I do want to clarify that the proposed wind farm off, close to being off Little Egg Inlet is close to a done-deal, meaning it would become the second working East Coast facility, after the now-functioning Block Island farm. It's when the AC project gets rolling that company eyes could quickly turn to areas off north LBI. Further below is the main player in wind energy for us ... and much of the Eastern Seaboard. Why do we need offshore wind? Offshore wind is a clean, safe, reliable way to power our homes, schools, and businesses. If we develop offshore wind, we can create millions of jobs nationwide while helping our nation retire the dirty coal-fired power plants that make us sick. Harnessing the power of wind off our coasts will allow the U.S. to power our country with clean, domestic energy and move beyond coal. What are the benefits of offshore wind? Offshore wind produces no air or water pollution as it generates electricity. Coal plants, by contrast, pollute our air with soot and smog that cause or worsen respiratory illnesses, heart disease, and asthma. Asthma from coal plant pollution is estimated to cause 3,000,000 lost work days and 554,000 asthma attacks each year, 26,000 of which are severe enough to require an emergency room visit. Coal plants also dirty our water with toxic mercury that can cause birth defects, neurological disorders, and developmental delays in children. How much electricity can offshore wind provide in the U.S.? According to the Department of Energy, the U.S. has up to 4,000 gigawatts (GW) of offshore wind along our coasts and the Great Lakes—that’s four times as much as the capacity of every U.S. power plant in operation today combined. Though we may not be able to harness all of this massive resource, and many sites may be excluded due to impacts to sensitive plant and animal species, even a small percentage would greatly reduce our dependence on coal. The Department of Energy has set a goal to install 54 GW of offshore wind by 2030. How does offshore wind help us to move beyond dirty coal-fired power plants? The cost of coal is rising, while the cost of renewables like wind is dropping every year. Offshore wind can replace our reliance on dirty coal by providing an affordable, reliable, and renewable source of energy. Where has offshore wind already proven itself to be a reliable form of clean electricity? Europe has been harnessing the power of offshore wind for twenty years and is a leader in offshore wind energy. In 2013, eleven European countries had a total of 69 offshore wind farms, powering the continent with 6,562 megawatts (MW) of wind power, with another 3 GW under development. China built its first offshore wind farm in 2010, providing enough power for 200,000 Shanghai homes. Offshore wind has been proven to be a reliable form of energy around the world: now it’s time for the United States to catch up. How many jobs could be created with offshore wind energy? The Department of Energy estimates that reaching its goal of 54 GW of offshore wind would create 220,000 American jobs over five years. And once built, those wind farms would sustain 43,000 permanent, high-paying operations and maintenance jobs. On a smaller scale, a 500 MW wind farm would create 400 permanent jobs and 2,000 construction jobs for residents of the areas near the wind farm. How reliable is offshore wind power? Offshore wind is strongest during the day and late afternoon, when our demand for electricity is highest. Other renewable resources, like land-based wind, are often strongest during the night. It is important to use a diverse portfolio of renewable resources, including offshore wind, land-based wind, and solar. These various energy sources, strongest at different times of day and in different areas, complement each other for a robust energy supply. How does offshore wind compare to onshore wind? Our wind resources are stronger and more reliable over our oceans, meaning offshore wind turbines generate more electricity. Offshore wind resources are greatest along our coasts and the Great Lakes, close to our nation’s population centers and existing transmission resources. This proximity reduces the costs associated with bringing power to homes and businesses from hundreds of miles away. Since the wind resources are stronger, offshore wind turbines can be significantly larger than onshore turbines and produce more power per turbine. By combining the power of our country’s land-based and offshore wind, we will be able to significantly reduce our use of dirty, polluting fossil fuels. How does the cost of offshore wind compare to other energy sources, like coal? The true cost of coal is not included in the price you see on your monthly electricity bill. If you tally up the costs to our economy from public health impacts (like premature death, hospitalizations from asthma, and heart disease), environmental degradation, and economic harm (like lost tourism revenue in coal mining areas)—coal costs our nationbetween $140-242 billion each year, according to a study by Harvard Medical School. Even using the study’s most conservative estimate, these hidden expenses more than double the average cost of coal-fired electricity. The cost of offshore wind continues to plummet as the industry matures. Though offshore wind has a higher upfront cost, utilities can lock in a stable energy price for decades, since the “fuel” (i.e., wind) is free. While fossil fuels are increasing in cost and continuing to harm public health, clean and reliable offshore wind can power our country at a stable, affordable rate for years. How far offshore will the wind turbines be? Will I be able to see them from shore? Offshore wind farms are typically located between five and 15 miles from shore. At that distance, they are about as wide as a toothpick and create minimal impact to shoreline views. What are offshore wind developers doing to make sure that seabirds and marine mammals are protected? Some studies focused on European wind farms have found that offshore wind is safe for seabirds and marine life. Wind farms have been found to help fish populations: turbines create artificial reefs, which provide an increase in fish habitat. Developers have developed techniques to minimize sound pollution to avoid harming marine mammals and sea turtles. While transitioning to offshore wind and other forms of power is a critical step in the fight to end climate disruption we must also be responsible stewards of our oceans. The Sierra Club is committed to ensuring that offshore wind is sited responsibly. Offshore wind projects should be constructed and operated in a way that avoids, minimizes, and mitigates impacts to environmental resources. This process is one that will require engagement from Federal and local authorities and from coastal communities. The development of large-scale, offshore renewable energy projects will require ocean zoning, environmental review, permitting and leasing of specific regions of the ocean, which will require new governance structures and legal frameworks. We’re committed to being engaged in that process. For instance, the Sierra Club is working with offshore wind developers and environmental advocates to ensure the protection of the North American Right Whale as offshore wind is developed along the eastern seaboard. Click here to see our letter to the Dept of Interior's Bureau of Ocean Energy Management on measures to help protect this critical species. We encourage our volunteers to be as involved as possible from the beginning of any site planning process, recognizing that the overlapping authorities and numerous agencies with jurisdiction will make this a complicated undertaking during the next few years. What can I do to support offshore wind in my state? Click here to find out more about offshore wind in your state. Ørsted has entered into an agreement with the D.E. Shaw Group to acquire a 100% equity interest in Rhode Island-based Deepwater Wind at a purchase price of USD 510 million. The two companies’ offshore wind assets and organizations will be merged into the leading US offshore wind platform with the most comprehensive geographic coverage and the largest pipeline of development capacity. New Jersey has some of the best conditions in the world for offshore wind development, with shallow water depths and strong wind speeds. We will perform a geophysical survey to determine the best location for the wind turbines off the coast of Atlantic City. The effort will help determine the physical, biological and economic suitability of the site. The company is committed to using the best available data to inform decision-making, and to involving all key stakeholders in the planning process and throughout the life of the project, including environmental and fisheries organizations. Offshore wind power is becoming increasingly affordable, with costs falling dramatically in recent years. We have been leading the efforts to bring about this cost reduction. We are driving the industry to reduce costs even further. In the U.S this will be achieved as the offshore wind industry matures and scales up, lowering cost over time. In addition, the anticipated technology improvements, resulting in larger turbines will also have an impact, further reducing costs. The Maryland Department of Natural Resources has announced results of its annual young-of-year striped bass survey in Chesapeake Bay, which documented healthy reproduction of the state fish. The 2018 young-of-year index is 14.8, higher than the 65-year average of 11.8. Known locally as rockfish, striped bass spawn in Chesapeake Bay and its tributaries each spring. 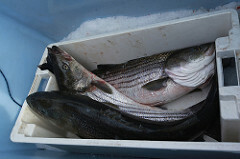 The juvenile striped bass survey is conducted annually to measure spawning success and help predict future abundance. The index represents the average number of young-of-year — those hatched in the current year — striped bass captured in each sample. During this year's survey, department biologists collected more than 36,000 fish of 55 species, including 1,951 young-of-year striped bass. Results show that white perch and American shad also experienced above-average spawning success this spring. "Consecutive years of healthy reproduction is a great sign for the future of this iconic species," Fishing and Boating Services Director David Blazer said. "The survey results are encouraging and complement our efforts to conserve and protect the striped bass fishery throughout the watershed for the benefit of anglers, commercial watermen and the species."